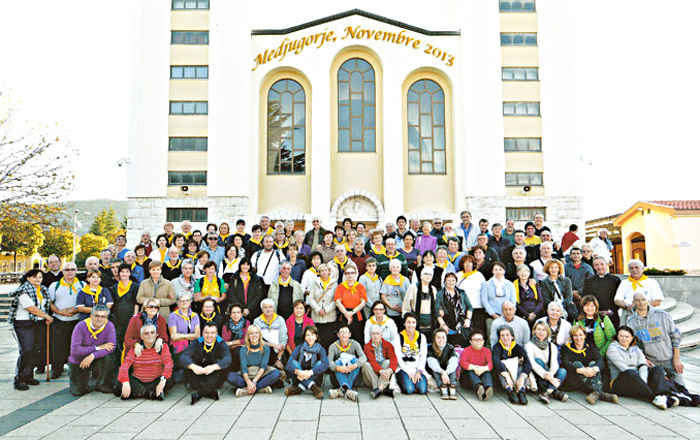 A few days ago the pilgrimage of parents and friends of the community went to Medjugorje. Our Lady was waiting for us to speak to us, to give us the graces She had prepared for each of us . To be sure we understood well Her words , that there were no shadows , we did find three days of glorious sunshine, no clouds between us and Her. We were able to get close to Her since the first day , climbing on Podbrodo , following the traces of reflection of our priests , who accompanied us in front of Her , letting us understand the importance to remain silent and listen to what Our Lady wanted to tell us. The strong momentum , remains one of the confessions . We should give thanks and pray for our priests, who have not spared a minute of their time to be available for this , giving up many times to themselves, to be able to offer the mercy of God at all times. In all places they were available to give us the Sacrament of reconciliation. They knew how important it was for us. The Way of the Cross on Cross Mountain marked another important milestone , letting us see so much of our poverty and made us make good resolutions which have put peace in our hearts ,and also words of peace came from the girls in the Field of Joy: nothing will steal them from our hearts. Of course for us parents and for all those who were with us , living the Holy Mass in the two houses of boys and girls warmed our hearts , especially for those who have been able to meet and embrace their son or daughter. Thank you Jesus and thank you Mary. Being the first pilgrimage of my life, it was for me unique and profound . The long bus trip , the very intense and well organized day had a big goal , a deeper reason to meet the Queen of Peace , the Mother of us all. In this spirit, motivated and happy, we experienced moments of individual and shared reflection. When I first arrived in Medjugorje, the first impression was of wonder , because everything took place in a special peace , just the peace of God, which is located in the silence. I saw a place where the only thing that really matters is prayer, where material things are not important .I was allowed to meet ordinary people who , with their faith enlightened our days . Going up to the Apparition Hill on the second day , I quickly realized that I was not there by accident , but it was the Madonna to call me to Her, to talk , to show me a new world: the world of faith. In Medjugorje, I opened my heart , and I began to pray with commitment and with the certainty that the Madonna was there to listen to me and to help me. In this place of peace and conversion , also known as the confessional of the world , you do not go away without having reconciled with Jesus. Then you learn to pray , pray in a simple, true way, felt with the heart. I really thank Jesus and Mary for having accompanied me during this pilgrimage , giving it a much deeper sense.